To state it plain and simple, older thermostats do not have the precision or ability to maintain efficient heating. In this context, “older” means any thermostat that has less functions than a basic digital thermometer. That usually means that it uses a slide, a dial, and lacks a digital screen. Not only does that mean that these thermostats are extremely limited in their functions, but there’s just too much room for error in their controls. Instead of being able to home in on a single number, they only allow for “approximate” temperatures between every 5° or 10°. On top of it all, there’s no denying the matter of age. These thermostats can’t be trusted simply because of how old they are. Efficient heating also depends on if the thermostat is accurate. Accuracy can drop if the thermostat is dirty or otherwise needs maintenance. If the thermostat is not recording temperatures accurately, that can have compounded effects on performance and efficiency. Start by removing the thermostat’s cover to see if there’s any dust or dirt in it. If there are any metal strips, wipe them off to ensure they’re able to properly conduct electricity. While there, make sure there’s no corrosion. 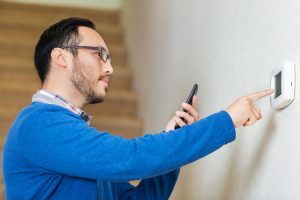 As for “maintenance,” thermostats don’t need very much other than to have their batteries changed and to ensure that the wires are connected properly. Thermostats sometimes need batteries in order to memorize any programmed schedules. And finally, check to make sure that the thermostat isn’t in direct sunlight or too close to warm areas like the kitchen. This can create inaccurate readings. Likewise, if it’s placed in an area that doesn’t reflect the average room temperature—such as a hallway—it can have a similar effect. Smart thermostats can make the job of maintaining efficiency far easier, but only if they’re used properly. If using a learning thermostat, make sure to start off the first week with good habits. The thermostat will learn from that behavior and make adjustments to the schedule as necessary. Some thermostats can turn off automatically when detecting the homeowner has left the home. Certain thermostats will indicate which temperatures are saving energy, thus helping the owner stay in line with saving goals. There are many brands of smart and WiFi thermostat available on the market, and some of their features overlap. For a homeowner looking into purchasing one, the best approach is to tell an expert of HVAC services in White Plains, NY what their comfort and energy saving goals are first. Contact Yost & Campbell Heating, Cooling & Generators today to learn more about using thermostats to save energy.